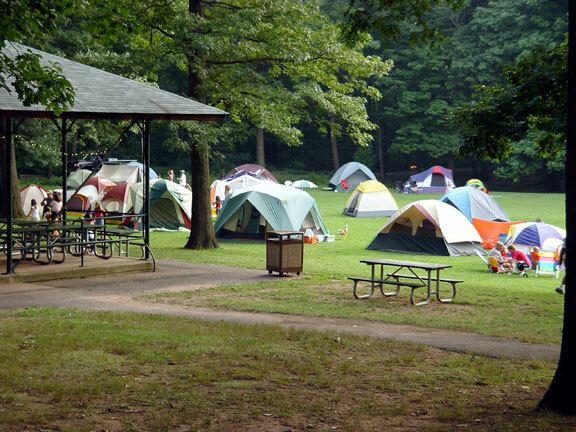 The first Woodland Park family camp-out was held during the week-end of July 17-18, 2004. About 24 families participated in this inaugural event which ran from noon Saturday to noon Sunday. The cost was $12 per family. Pre-registration was required. Dinner included hot dogs, hamburgers, salads, etc. The pavilion fireplace was lit at about 8 p.m. for a traditional camp-fire marshmallow roast. There was freshly made popcorn, ice cream sundae's and cookies during the evening, with more hot dogs & hamburgers being served at about 10 p.m.. A continental breakfast was provided at about 7:30 a.m. on Sunday morning. There was a visit from "Rizzo's Reptile Discovery" who gave an informative presentation and hands-on encounter with different types of reptiles to include snakes, lizards and turtles. Other activities included: organized games of frisbee, football, etc., and an arts and crafts program for kids. An inflatable "moonbounce" for kids to enjoy, was available from the afternoon to about 10 p.m.. The event was sponsored by the Hasbrouck Heights Recreation Department.